Historic charm, timeless traditions, and modern architecture fuse in Vancouver’s edgy Chinatown neighbourhood, where a site previously occupied by a parking garage is now home to Juniper Kitchen & Bar. West Coast lifestyle and philosophy play heavily on the interiors and cuisine, where Simcic + Uhrich Architects have designed a textural space of raw materials that lend the 104-seat restaurant an understated coolness. 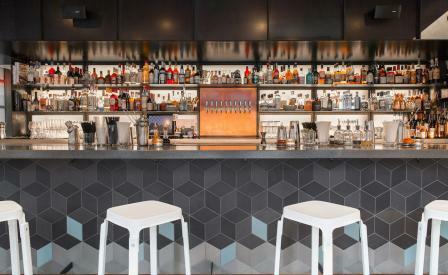 Case in point is the vaulted ceiling that arches above a concrete, copper-dusted bar top. Crafted out of bended plywood, it calls to mind skateboarding ramps or ocean waves (depending on whether you ask the architect or owner Lilian Steenbock). A whimsical mural that wraps around the mezzanine lounge illustrates the folklore of the Pacific Northwest. Meanwhile in the dining lounge below, a piece by artist Ricky Alvarez features hundreds of foraged driftwood branches amassed in the Gulf Islands. Chef Sarah Stewart pays homage to Canada’s culinary heritage and her love of nature with a seasonal menu that highlights ingredients from ocean, deserts and verdant forests of the Pacific Northwest. Dishes like the back cod on a bed of cauliflower puree with braised endive, duck fat potato and crispy duck skin are playful yet comforting. Behind the bar is Shaun Layton, who showcases his deep passion for artisanal and small-batch spirits with a tantalising cocktail menu. As you might expect given the restaurant’s name, the Gin & Tonic selection is front and centre. Try the Catalan, which features Defender Island gin, thyme, grapefruit and Mediterranean tonic.